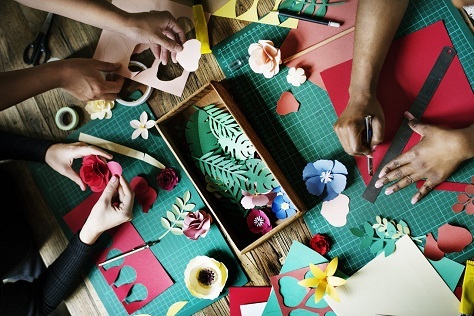 Completing art and craft projects with the kids can be a fun and fulfilling way to get everyone together in an educational experience that also provides some extra bonding during your spare time. However, if you’re not already involved in art and craft, you might be wondering where to start and how to proceed. Understandably, you may not even have a clue about what kind of project you’re going to attempt first, as there are so many options and it’s hard to tell which are best for beginners. With that said, here are four types of arts and crafts that are perfect for the whole family. Making paper crafts is easy, cheap, and the art and craft materials (i.e. stacks of paper in various sizes) that are used for this hobby can be bought in bulk to allow for plenty of experimenting without worry. There are lots of guides and videos that will teach you how to make basic origami shapes, and the kids will love doing this after school when they’re done with their homework. Plus, it doesn’t take much preparation or planning to sit down and start folding paper, so it’s something that can be done spontaneously in a few minutes’ time. Wood crafts are also great projects to do with the kids because you can use so many different kinds of wood and incorporate all kinds of designs. You can even save ice cream sticks, toothpicks, and tablecloth clips to use as materials in your next wood craft project. Assorted wooden blocks are also items that are typically found in a toy box, so you may already have most of the materials you need to get started. If your kids have some old clothes that need some aesthetic rejuvenation, why not turn them into an art project by adding some new designs? You can use a t-shirt press to press new designs onto blank shirts, or use markers, glitter, patches, and other small components to add extra visual appeal to an otherwise boring piece of clothing. You can also take things a step further with sewing, knitting, and crocheting to teach the kids about hobbies that many young people aren’t familiar with. Completing STEM (Science, Technology, Engineering, and Math) craft projects can be a great way to educate your kids in a memorable and fun fashion. Plus, you can find plenty of suggestions to start with online, and most of them are simple enough to do in less than an hour with a small amount of materials and effort. In closing, although arts and crafts are often a rare and occasional activity in many homes, you can get some great enjoyment and quality time with your kids by making it something that’s done at least a week. Set aside a special craft day or try to at least do one project on the weekend to keep your kids interested and engaged. Boris Dzhingarov graduated UNWE with major marketing. He writes for several sites online such as Semrush.com, Socialnomics.net, Chamberofcommerce.com. Boris is the founder of ESBO LTD and Cryptoext. You can connect with him at Twitter, Linkedin.